Testing of electro-chemical metal oxide thin film toxic gas sensors. 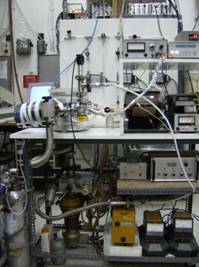 The setup consists of an Al-vacuum chamber including a home-made furnace for sample heating up to 400 oC, a pumping station and vacuum gauges, a gas handling system consisting of two PC-controlled flowmeters for the test gas and air as buffer. 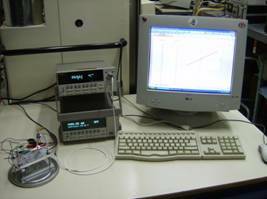 Gas detection results to conductivity change of the test gas, which is recorded in real time by the PC. RT measurement (van-der-Pauw) of the electrical properties of semiconducting metal oxide thin films. The setup consists of a stabilized Keithley Mo. 6220 nano-Ampere source, a Keithley Mo. 2182nano-Voltmeter and a home-made sample holder with 4 needle probe electrodes. A parallel IEE-488 interface controls the instrumentation. The laser beam enters the setup from the left of the picture, while the SHG signal PMT detector (532 nm) is seen at the right. The system also comprises the related electronics and home-developed software.